Portrait of Helen Keller, seated, with Anne Sullivan Macy and John Macy, circa 1909-1919. Often, when I write, I try to put myself in the subject’s shoes and imagine seeing life from their perspective or hearing the sounds around them. This can’t be the case for Helen Keller. I did attempt to place myself on the tenji buroku, or the bumpy yellow lines for the vision impaired on Japanese sidewalks, close my eyes and plug my ears. I made it about five steps before giving up. From that epiphanic moment at the fountain, the “little bronco” would go on to live an enormous life, traveling to over 30 countries and being awarded the Presidential Medal of Freedom in 1964 before passing away four years later at the age of 87. Other than starting Helen Keller International in the United States, Keller’s greatest societal impact can be found in Japan, where she visited in 1937, 1948 and 1955. Today, we’ll look at her first visit. On April 15, 1937, Helen Keller and Polly Thomson (her “eyes and ears”), landed in Yokohama Bay after a two-week voyage across the Pacific aboard the Asama Maru. The trip had been discussed as far back as 1934, when Kwansei Gakuin professor and Nippon Lighthouse founder Takeo Iwahashi traveled to her home in the Forest Hills neighborhood of Queens, New York, where he was greeted by Keller’s eight pet dogs. Back then, Anne Sullivan (the teacher who first brought a 7-year-old Keller from that “dark, soundless silence”) implored her to visit Japan and help the very roughly estimated 160,000 blind and 100,000 deaf citizens of Japan — only 4,000 of whom (according to Iwahashi) were receiving any form of education. Sullivan would soon pass away in 1936, leaving a heartbroken Keller with an incredible desire to fulfill her best friend’s request. The trip didn’t start well. 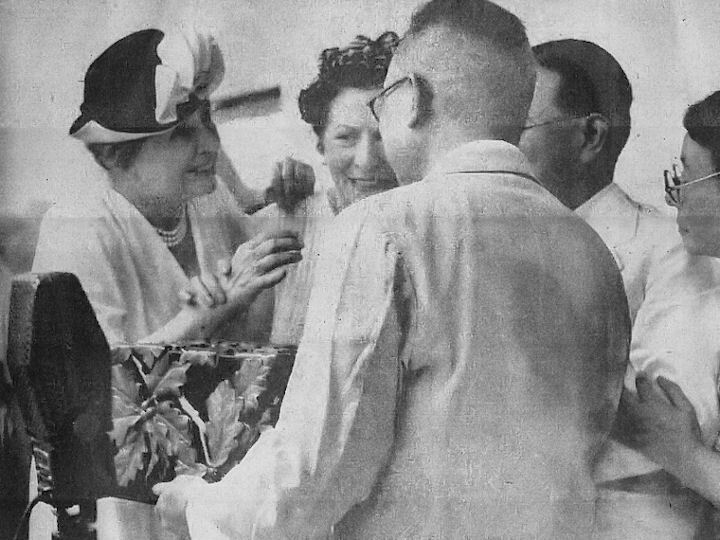 Mainichi newspaper photo of Helen Keller visiting Japan on another trip in 1948. On the same day she arrived in Yokohama, a “pickpocket” (police suspected a Japanese teenage boy) ran past Keller and stole her “address book and more than 200 yen (around $57.18).” The incident was published in English-language newspapers in Japan as well as local newspapers in the United States. Japanese government officials (who sponsored Keller’s tour) were embarrassed, but their published statement about the matter showed the ever-growing contentious relationship between the two countries. “In Japan,” wrote the Asahi Daily News, “we have a phrase ‘chivalrous robber,’ but the offense against the holy American woman who brought light and hope to the world’s millions of deaf, dumb and blind is the crime of an unchivalrous robber, amounting to a national shame.” Hmm, American newspaper readers may have thought, so if the thief had stolen from a “typical” American, it would have been chivalrous? Unfortunately for Keller, the “imperial household officials” couldn’t reciprocate their appreciations. Annoyed murmurs rippled throughout the country that Keller “wore a black dress and a three-quarter length black coat. Court rules forbid anything suggestive of mourning.” Without knowing, Keller, the American, had disrespected the emperor on his own soil. The Asahi Shimbun later wrote that Keller’s “miraculous voice” was also heard by Hisako Nakamura, who at 39 years of age had inspired Japan by living a full life despite losing her arms and legs from gangrene at the age of 3. Nakamura-san brought Keller to tears by presenting her with fragrant “flowers and dolls” that she’d made herself. They embraced and Keller empathized with her condition, expressing that Nakamura-san has had to endure an even more troublesome life than her own. Another April event in Yokohama stood out thanks to an article by female Australian journalist G. L. Winchester, writing for “The Age Literary Supplement.” What the journalist witnessed that day without question stands as a communicative miracle. The trio stood side-by-side and expressed themselves via a three-step process. Keller would first fingerspell into Thomson’s palm and Thomson, standing in the middle, would then speak to the crowd in English as Iwahashi translated her words into Japanese. Still, Keller would return to Japan two more times and with each visit new supporting facilities for the disabled were created thanks to an increase in fundraising and public awareness. One of these programs became the Tokyo Helen Keller Association, established in 1950, and is still going strong in Shinjuku. Next month, we’ll explore the life of the Great Bambino — Babe Ruth — and the extremes of patriotism during his 1934 baseball tour in Japan. She is still an inspiration and a great motivator.